It's been a hectic week of visiting nests, still trying to get bands read but so many nests are incubating now it's become difficult. We are finding new nests that are just being built now so we are working on identifying those birds. I find myself watching the Ospreys with the color banded leg tucked up so often....in their foot pocket! I ponder why they always tuck up the color band which is usually on the right leg. Do you think if we placed the color band on the left leg we would have fewer problems? Or do you think they would then become right legged standers and tuck up the left leg? Are they really just being difficult? How long can an osprey actually stand on one leg? Very long.....longer than my patience sometimes. Some of them seem to have learned to take off without ever really putting the banded leg down! Ah the frustrations we face! But I never give up. It's so fun to watch an osprey I have known for many years, and realize that even without reading the band, I find their faces familiar, their head markings so unique. I think it's late enough now to sadly conclude that some of my favorite birds have not returned and are probably no longer alive. Our oldest male, who I had known since he was two years old, has not shown up. His mate of 14 years seems to have found a new partner. I am not sure the deal is sealed tho. I thought that my old friend, who was 22 last year, did not seem to be his usual self last year. He was a male who was so dependable, always easy to find, perched near his nest watching over his family....but last year I often had trouble locating him, the female was often seen bringing fish, but then he would show up again. I will miss him....one of my first loves. And the wonderful male whose chick ended up in rehab last year, has also not shown up. He was so attentive to that youngster who stuck so close to home after I released her ( after her 24 hour adventure which she never explained). He was always seen on his lofty perch, visible for miles, as I drove to his nest. He stayed for one week after the last chick dispersed....flying around with a fish to see if anyone needed it. After a week of no takers...he finally left on his migration. I missed him all winter as I drove past his perch. I was anxiously awaiting his return, but it has not happened. In his place we have another bird that I know quite well...one who was somehow displaced from his territory, and spent last summer visiting nests all over the metro area, looking for a mate and a territory. I am glad to see him settled down with a mate and chicks on the way. I wish him great success, but I also remember the male he has replaced, with some sadness. This is nature, this is life going on, and this is the life of a researcher who has followed a population of birds for 23 years....I know so many of these birds as my old friends. They are like family to me. Here is a link to the blog that Emyr posted about polygamy....so great to be able to share what I have observed during all these years. It's an interesting read. I woke up in the middle of the night and remembered yet another instance of polygyny in our population of Ospreys. Another male who was attending two nests that were almost in sight of each other. These two nests were not as close as our most current case. Chicks hatched on both nests, three chicks on one nest and a single chick on the other. Sadly the single chick was found dead below the nest, probable predation. So, once again, only one nest was successful. That brings the total cases of polygyny to seven,that I know of. And only once did both nests succeed. To those of you that are reading the blog but not the Facebook page...the last few posts have generated a lot of comments and conversations....you might enjoy going to the Facebook page to read them. So fun to communicate with people all over the world about osprey behaviors! Been having fun the past few days emailing Emyr Evans of the Dyfi osprey project In Wales. As some of you may know, Monty now has two nests and two females. It is a behavior I have observed here five times. (It occurred one other time prior to my involvement in the project). So Emyr contacted me to get my thoughts. It's so great to talk to other osprey researchers and share our observations. Sometimes I hate this internet / Facebook thing because in some ways it separates us, but in other situations it allows us to connect and learn from people on the other side of the planet. That, I love. Anyway, it will be interesting to see how things turn out over there with Monty. Out of the five times I have documented polygamous behavior, four times involved a male going between two nests. Sometimes those nests were at least a mile or two apart, and sometimes they were within a few hundred yards (within sight of each other). Only once were chicks produced at both nests. And that male managed to produce three chicks at two nests and all chicks fledged! It surprised me! In fact I predicted that one of the nests would fail, which is what usually occurs. The Ospreys proved me wrong, and it's not the first time! The success was largely due to significant help from those females as well, who did help provide fish for the chicks as they became old enough to for her to leave them for short periods. One case of polygyny ( polygyny is the term for one male with two females, polyandry is the term for one female with two males, and polygamy is the larger category that includes both of those...for those interested in correct terminology) I observed two females sharing a single nest with one male. They shared fish and shared Incubation duties, but when a single chick hatched one of the females lost interest and departed. The next year she had her own male and her own nest. Did she know the chick was not hers, or was it just too many birds in a nest? ( in 1986, prior to my involvement in the project, two females laid six eggs in a nest with one male, and none of the eggs hatched). Well, one of our males has done this three times now, including this year. Now we have documented him at both nests. Quite often one nest will get more attention than the other, and it can be sad to watch a male ignoring one of the females as she begs for food while incubating. I often have to remind people that Ospreys are not "bad" for engaging in polygamy. We should not project our anthropomorphic moralistic ideas upon these birds. 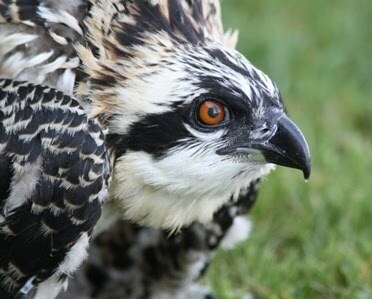 Ospreys are largely motivated by two instincts....to survive and to reproduce. So when an opportunity arises to reproduce twice in one breeding season, some males will take advantage of it. It is often a result of nests being too close together. It's natural for a male to defend his territory against other males, and yet to allow another female into the territory. Some females would chase away another female, but if the male is allowing it, it sends a signal. I think there are all kinds of subtle signals being sent that we humans may not understand. When the male does not care for the secondary nest, it can be hard to watch, and our human hearts get upset...but that male is making decisions about his own survival, and how much energy he has to provide for two families. The behaviors of the Ospreys change as our population increases and there may be more opportunities for these situations to occur. We are learning as we go...and now also learning as we communicate with other scientists around the world! Stay tuned! I am going to start a slightly controversial conversation here, and I know some of you will not agree with me, but many will. The question is about posting specific locations about nests online. I have made a very considered decision not to post locations on this page. I am becoming increasingly troubled by other sites where people do post clear locations, road names, directions etc. Unfortunately, I have seen birds harmed by people who make very poor decisions about wildlife. Our oldest male last year had to be euthanized...among his many injuries were BB pellets. I have been watching a nest where chicks have pre fledged several years in a row, ending up on the ground, vulnerable. One died, one was rescued. I learned that someone was flying a drone over that nest to get photos. I have seen too many people approaching a nest with a camera only to have the adults fly off the nest, screeching alarm calls and causing them to leave eggs uncovered. Sometimes they happily tell me that the birds are "talking" to them. Yes they are...they are saying, get away from my nest! I know that most of the people reading this page are true bird lovers who would never do anything to disturb our beloved Ospreys. But the difficult part about a page like this, a blog, or any social media site, is that anyone can read it. We are reaching people who may not have the birds best interests in mind. I try to educate here, and with this post I am asking everyone to consider what the ripple effects are of sharing too much in public forums. I am happy to share privately with people I trust, but am very careful about what is posted publicly. Last year I returned a rehabbed chick (who pre fledged) to a nest and the youngster flew off upon release and it took her 24 hours to find her way back to the nest. At that point she was dehydrated, hungry and a little freaked out. A photographer was there and I explained the situation and asked him to please give this bird at least 24 hours undisturbed to get used to being back home before he approached the nest at all. Within an hour he was right under the nest taking photos. The adult male was flying and giving alarm calls, trying to protect his offspring. I suppose this produced some great photos. Some people do not care about the welfare of these birds. So I am just saying....be careful. Please put the birds first. I can't control what some people post on other pages, but I can control it here and I will hide any posts with specific directions or locations. We do talk openly about the Arboretum cam, because people do not need to go there to see what's happening. I wish we could afford more cams. In other countries, nests are protected much more than they are here. I know many people understand and share my concerns...so think before you post. P.S. Anyone who wants to talk about specific locations should email me privately.